BALTIMORE, Maryland (CNN) -- You know you've arrived at Bengies Drive-In Theatre when you first see the giant movie marquee, announcing the features showing that weekend. Each letter has to be placed and adjusted by hand, as it did when the theater first opened. 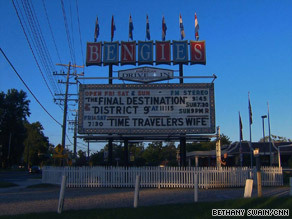 Bengies Drive-In Theatre has been owned by the same family since it opened in 1956. "As far as the operation of the drive-in goes, I'm kind of a die-hard. I try to make it run the way it did, to bring a little bit back of the '50s. ... the integrity and the innocence of that age," says Bengies owner D. Edward Vogel, who claims to have the largest outdoor movie screen in the country at 52 feet by 120 feet. Vogel has spent most of his life trying to maintain the feel and charm of the Baltimore, Maryland, drive-in movie theater that his family opened in 1956. Vogel wants moviegoers to have the same experience as he did when he went to his family's outdoor theater as a child, although he knows that people today have many more entertainment options. "Sometimes I'm actually taken aback with the amount of children that are fascinated with this," says Vogel. "Thinking of what their options are, with modern devices and videos and all that, that they are so taken aback . with what happens here." Vogel started learning, at age 9, the secrets of running a movie theater from his father, Jack Vogel. He has worked tirelessly since to maintain the theater as it was in its glory days. Vogel even operates the same machines that he did as a child; the projection room is filled with the original projectors, which Vogel cleans and cares for each night. The scene immediately invokes a feeling of nostalgia, reminding us why they were called "motion pictures" way back when. Yet, Vogel is quick to tell you that keeping the 53-year-old business alive hasn't always been easy. At Bengies, each night is a double feature, so guests can see at least two movies for $8 a person. Vogel estimates that Bengies makes 40 percent of its revenue from ticket sales, and the rest comes from concession purchases. There's a strict "no outside food" policy, and he's open about the fact that the food sales help keep the business open. The waterfront property would be more profitable as condos, he says, and his father planned to build them before Vogel took over the theater in the 1980s. He was only able to avoid closing by cutting costs and staff. "My parents had a union operator in the booth, they had a manager, they had a concessionaire. I am all of those things, so that has changed," Vogel says. Vogel even acts as the host. Known only as "the voice" to his audiences, he starts each night by using the theater's speaker system to welcome everyone to his venue. "When you see the sun setting, and the shadow being cast on that screen, no matter what has happened during that day, good, bad or indifferent, I become a different person when I turn the microphone on." Besides the challenges of being a small business owner, Vogel's efforts to maintain the integrity of the movie-going experience is challenged by another intrusion of this modern world -- light pollution. Between car headlights and brightly lit businesses nearby, a once-dark sky is now polluted with obtrusive light. Bengies asks that drivers turn their headlights off when entering the grounds of the theater. But over the years, it has been the outside light from other businesses that bleeds into the surrounding sky, making the giant screen hard to see. For solutions to such predicaments, Vogel turns to the owners of other drive-in theaters that have managed to survive since the 1930s. He is an active member of a drive-in theater owners association and is working with other owners across the country to support each other. "They would all have easier lives if they opened Laundromats in the right location, but they don't. They endeavor; there is a passion about it," Vogel says. It is a passion that his audience seems to appreciate. As the sun lowers in the sky and eventually sets behind the screen, the ticket booth is opened on a Sunday night in autumn. People make the trip to the last drive-in theater in the Baltimore area. They set up their chairs, and some sit in their classic cars to enjoy the show. It's an experience Vogel hopes to keep around for generations to come.